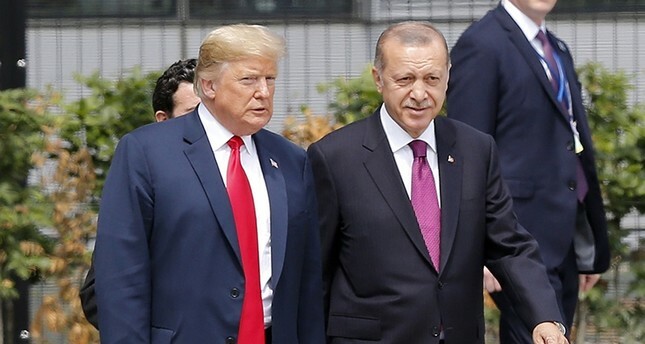 On the eve of a possible Turkish counter-terrorism operation in northern Syria, President Recep Tayyip Erdoğan and his U.S. counterpart Donald Trump on Friday agreed on the need for more effective coordination in Syria, according to an official statement. According to the statement by the Turkish presidency, the two leaders discussed bilateral issues, security and anti-terrorism issues, especially regarding recent developments in Syria, during a phone call. President Erdoğan expressed Turkey's legitimate concern over the actions and presence of the PKK-affiliated People's Protection Units (YPG) in northern Syria. Erdoğan said earlier Friday that Turkey will conduct an anti-terrorist operation in Manbij if the U.S. fails to clear the YPG from the northern Syrian region. He also reiterated Turkey's determination to bring peace to the area east of the Euphrates River in Syria. Earlier this week, Erdoğan announced that Turkey would launch another anti-terrorist operation in northern Syria, targeting the area east of the Euphrates within a few days. The United States' ongoing steadfast support to the YPG and the terrorist organization's subsequent increase in strength in the region have prompted Ankara to take necessary steps to ensure its national security. Previously, Turkey targeted the PKK terror group's Syrian affiliate YPG in two cross-border operations, Operation Euphrates Shield launched in August 2016 and Operation Olive Branch in January 2018, as well as through air and artillery strikes.